We started after a sumptuous breakfast, provided by Rotary Midtown of Kollegal. We walked through the villages Hosahanagalli, Saragur, Naripura, Dhanagere and finally reached Sattegala. Today’s walk left us feeling low for many reasons. One, the response of the community was varying between indifference and apathy. For the first time during the walk, we had to abort the street play midway during the performance. We were also not sure who was providing lunch or dinner till it arrived. The coordinator for this stretch had to leave and this affected the logistics and coordination. A couple of key members fell sick, adding to our worries. At Sattegala (the intended place of stay for the day), we realized that no arrangements had been made. We had to negotiate with the local composite school for a place to stay. The Head Master was very indifferent to us. The team was feeling depressed and the morale was ebbing. Mr.Jayaram, the CEO of Zilla Panchayath, responded to our plea for help and got some arrangements made at the school through the BEO. We now realize that mere ‘human’ intervention is not enough to pull us through the walk! Sleep is indeed becoming a rarity. But, each passing day is restoring my energy and giving me back my lost faith in the power and presence of Swami Vivekananda. The evening prayer at Hosahalli was one of the best held till date. The setting was an open one in the center of the village with 3 temples and a Mutt surrounding us. The children of the village joined us in large numbers for the prayer. We then had a good street play performance. 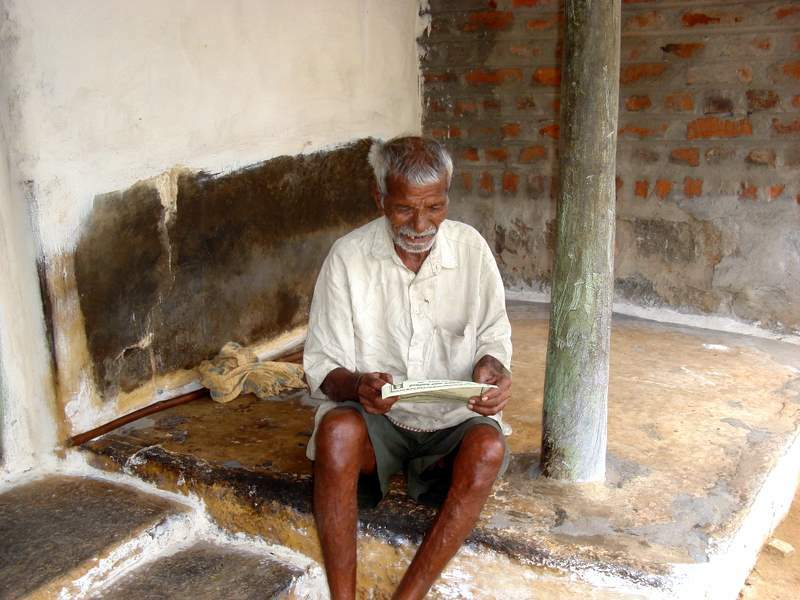 One of the villagers, Nanjappa, who was the previous Panchayath President, spoke on corruption. He brought out the perspective that the community needed to be a watchdog for politicians and hold them accountable. He stressed that the incentive for politicians to become corrupt was the illegitimate and corrupting demands of the community itself. His call to the community was to become honest before demanding honesty of their elected representatives. This Yathre is truly a grassroots revolution. Hopefully, somebody somewhere in India would want to imitate it and spread the message in their areas….